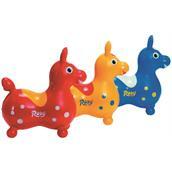 The Gymnic Line Rody Horse is a favorite with children! Made in Italy from super strong yet soft latex-free vinyl for long lasting use and durability, this horse is a great exercise product for indoors and smooth, safe outdoor surfaces. Promotes body coordination, balance and lymph circulation while providing a fun workout. Recommended for ages 3 through 5 years.